Limescale buildup, which consists of calcium and magnesium deposits typically found in hard water, will clog various plumbing fixtures, including toilets. A toilet clogged with lime scale deposits will slowly stop working as well as it once did until the toilet will no longer flush waste down the drain. Installing a water softener in your home will help avoid future problems with lime scale or other buildup clogging your toilet. These deposits will not only clog the ports under the toilet's rim, causing problems with the toilet's ability to flush, but they can also clog the refill valve so it will not close completely and the toilet runs constantly. A water softener will filter these deposits out of the house's water before it reaches the plumbing fixtures. As lime scale and other deposits in the water build up in the toilet's ports, the flushing power of the toilet will diminish. Toilets hold fresh water in the tank in preparation for when you push the handle, which will pull the chain that lifts the cover of a large drain hole in the bottom of the tank. 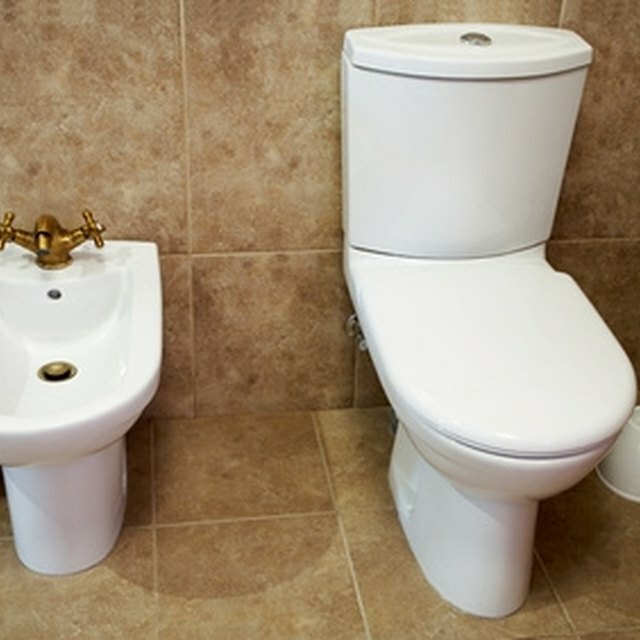 The water flows out the tank through the drain hole and flows into the bowl through a series of small holes under the toilet's rim, called ports. Clogs in the ports may cause the toilet to lose enough flushing power that you can no longer flush waste down the drain. Using different tools, you have the ability to break free limescale deposits in the port openings under the toilet's rim. If you have trouble seeing under the rim to perform the cleaning, use a small mirror that you hold over the toilet's bowl. Use objects that are long and thin, such as wood skewers, to insert into the port openings. Avoid using metal objects such as wire hangers, if possible, since metal may scratch the porcelain surface inside the toilet's bowl. If manual cleaning does not restore the toilet's flushing ability completely, turn to acid cleaning to remove lime scale not only from the port openings in the toilet, but also from the water passageway between the tank and the inside of the bowl. Ventilate the bathroom before you mix one part muriatic acid with 10 parts water in a bucket. Slowly pour half of the bucket down the overflow tube in the toilet's tank, and wait half an hour. Flush the toilet to break up the limescale in the passageway, and pour the other half of the acid and water mixture down the overflow tube. Wait another half an hour before flushing the toilet again.